The wave of teachers’ rebellions continued on May 16 in North Carolina, where tens of thousands of teachers, support staff, students, and allies marched on the State Capitol in Raleigh. 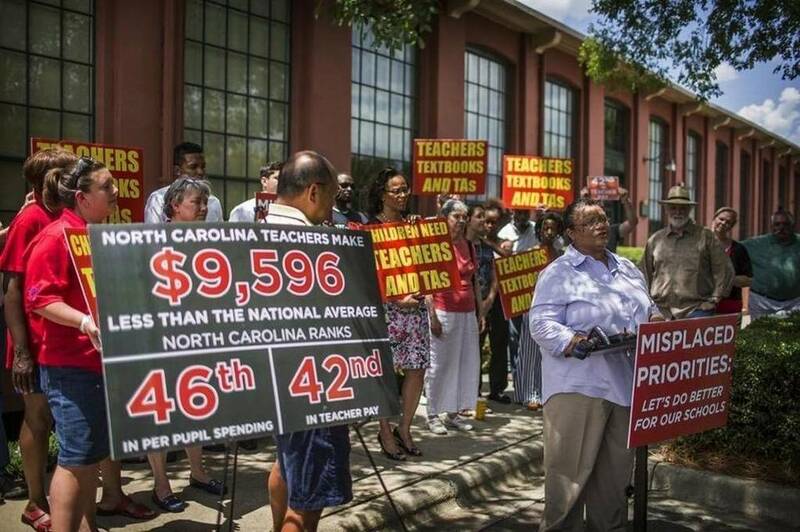 The demonstration, organized by the North Carolina Association of Educators (NCAE), called for better pay, more funding for education, and broader demands, such as an expansion of Medicaid and an end to corporate tax cuts. It is the latest of the teachers’ struggles started by the historic strike by West Virginia teachers at the beginning of the year. There are even direct connections, as the head of the NCAE, Mark Jewell, is a former West Virginia teacher. Despite raises in wages over the past few years, North Carolina teacher salaries, adjusted for inflation, have actually decreased 12% over the last decade and are $9,000 below the national average. North Carolina ranks 39th in per student spending, $2,400 less per student than the national average. Part of this has been the role of charter schools. Per student funding is lost for public schools when students leave to attend charter schools, further driving the downward spiral of resources. This also has, in effect, created a trend towards re-segregation, with black children more likely to be left in the resource-starved public schools. As a “right-to-work” state, North Carolina does not give teachers the legal right to strike. North Carolina is also home to some of the most regressive labor laws in the U.S. including a Jim Crow-era ban on public sector collective bargaining. Teachers used “personal leave” for the walkouts, which effectively took on the character of a one-day strike. This strike is unprecedented in the history of North Carolina teachers and shuttered schools in many districts around the state, representing 68% of NC students, including the six largest school districts. Forming the background for the walkouts has been the “Moral Mondays” movement, led for the past few years by Reverend William Barber. Moral Monday direct actions and marches included demands around public education and featured teachers’ contingents. As well, over the last couple of years teachers and support staff have organized school “walk-ins,” where they attend school wearing red shirts for visibility. However, this step toward shutting down the workplace is a new and monumental development. On the state level, a Democrat was recently elected governor, but the state legislature has been controlled by the Tea Party wing of the Republicans since 2010. Much like other states in the recent teachers’ strike wave (except Colorado), North Carolina went for Trump in the 2016 presidential elections. In response to the walkout, the General Assembly (NC state legislature) is now in session considering altering the two-year budget proposal passed last year that included a $2.5 million cut to education. The Democratic Governor Roy Cooper has previously expressed support for an 8% increase in teacher pay, while state Republicans have capped their proposals at 5-6%. The other issues brought up by teachers have not been directly addressed in any coherent way by legislators, so at this time it is unclear exactly what the outcome may be. There are critical questions facing teachers in their fight. From the outset, the Republicans have been hostile toward the teachers’ demands, with a GOP State Representative even going so far as to call the teachers “Teachers Union thugs.” In contrast, many prominent state Democrats, including the governor, have made statements supportive of the teachers’ actions. Many of the walkout leaders and the NCAE have expressed the intention of directing the energy into the November elections and returning the General Assembly to the Democrats. The question of defeating the right wing under the current Trump presidency faces working people across the country. It is particularly acute in states like North Carolina, and almost all the other states where the Republicans have a majority in their state house and teachers have rebelled. But can we count on Democrats to defeat the right-wing agenda? While in opposition in state government the Democrats have pledged support for the teachers’ action and goals as a mass movement is in large part directed at the state Republicans. However,the Democratic Party ruled for almost 150 years in North Carolina following Reconstruction, only to be unseated by the Tea Party revolt in 2010. State and national Democrats’ unpopular policies in the past, including supporting the privatization of education and cuts, are one of the big reasons that states like North Carolina now lie in the iron grip of the right wing. In some of the teacher revolt states, teachers themselves are running for different political offices. This is a step forward. However, they have overwhelmingly made the decision to run in the Democratic Party instead of independently, which we disagree with. Teachers across the country should consider running their own independent candidates, accountable to the needs of teachers and other working people, not within the party whose pro-corporate policies led to the current education crisis and ascent of the right wing. With the end of the school year fast approaching, it is possible that this may be the end of the teachers’ strike wave for now. However, we shouldn’t lose sight of the key lesson of 2018 so far – that it is mass strike action that has fundamentally changed the balance of forces in the teacher struggles, not waiting for the politicians to act. It is this fighting spirit that will be the biggest determining factor in what teachers and other workers will be able to win in the future, as corporate politicians in both parties will bow to big business pressure without a counterforce. North Carolina shows that even in the states with some of the lowest levels of unionization, the fighting spirit and tactics of a mobilized working class can have a massive impact. Next articleLabor Upsurge: University of Washington Grad Student Workers Strike!